There seemed to be a remarkable amount of grunting and shoving going on in the workshop – in fact it was sounding more like a barnyard during the mating season, than an engineering exercise. The cause? 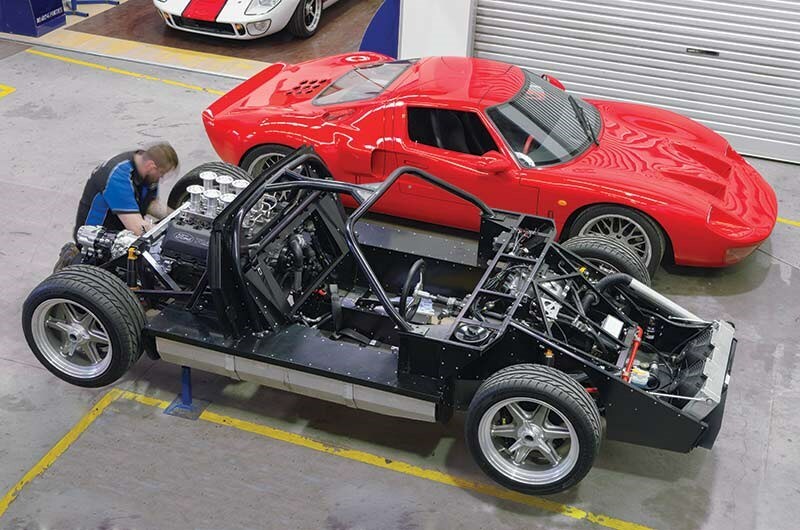 The good folk at Roaring Forties were sliding a big shiny new V8 into the mid-section of our GT40 replica. At last, the petrol heads had something serious bling to ogle. 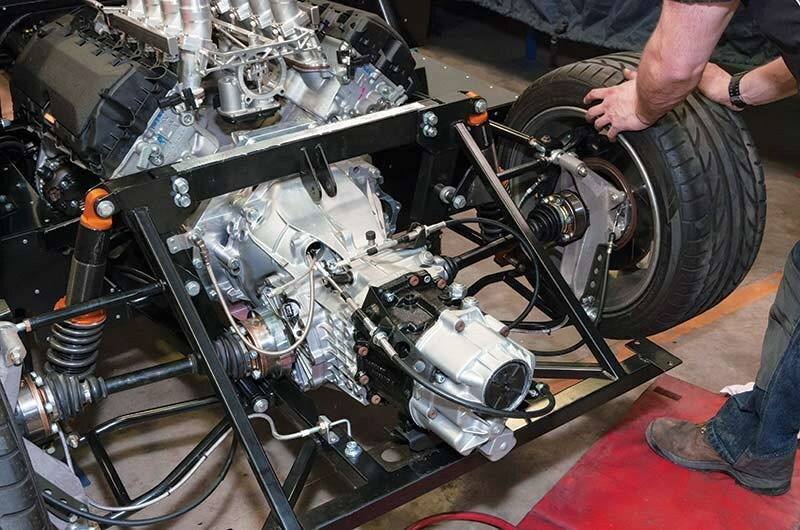 Up to now, we’ve been spending time panelling the chassis, mounting up the basic rolling gear, setting up the basics for the driving position and fitting the plumbing and wiring. The end result of all that effort has been that we’ve got a chassis on a set of shop wheels that looks vaguely car-like, but it’s hard to be completely convinced until there’s an engine in there too. After a lot of trials over the years, the Roaring Forties crew has settled on three main packages: a 302 Windsor from the AU series Falcon XR8, a 5.4 litre modular series quad-cam engine from the BA to FG XR8s (which is the standard engine quoted on for the car) and, more recently, a new 5.0 litre Coyote. So what are the pros and cons of each powerplant? The Windsor is the traditional choice, however while the starting price is lower, there is more trouble and expense involved in fitting it to the chassis. The 5.4 engine in 260kW (350hp) form is now the ‘standard’ unit quoted on for the car, and offers enormous performance potential (including supercharging), while the Coyote is probably the way of the future, thanks to its all-alloy construction and ongoing development. 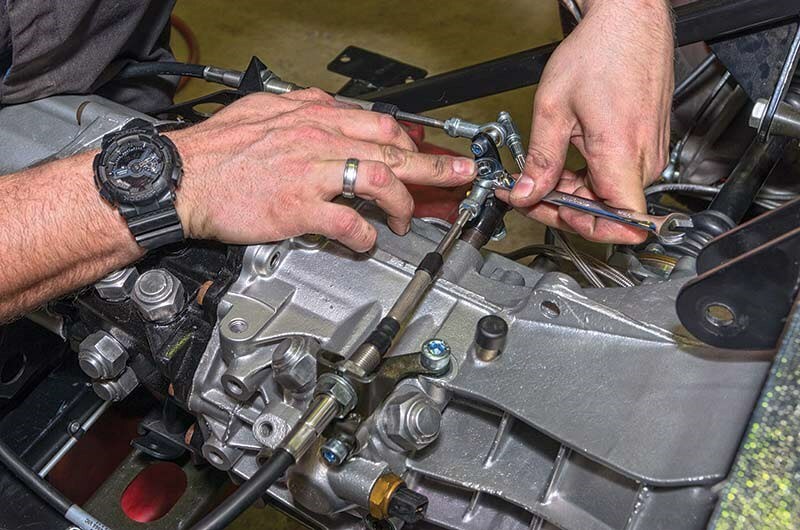 Adrian Sorensen, who’s been leading us through this project, is clearly a fan of the Coyote – to the point where he’s fitting one to his own car. "It’s also from the modular family," he says, "But it’s an all-aluminium block, so it’s 47 kilos lighter. In a car that weighs 1000-1050 kilos, that makes a big difference." There is enormous potential in the Coyote. 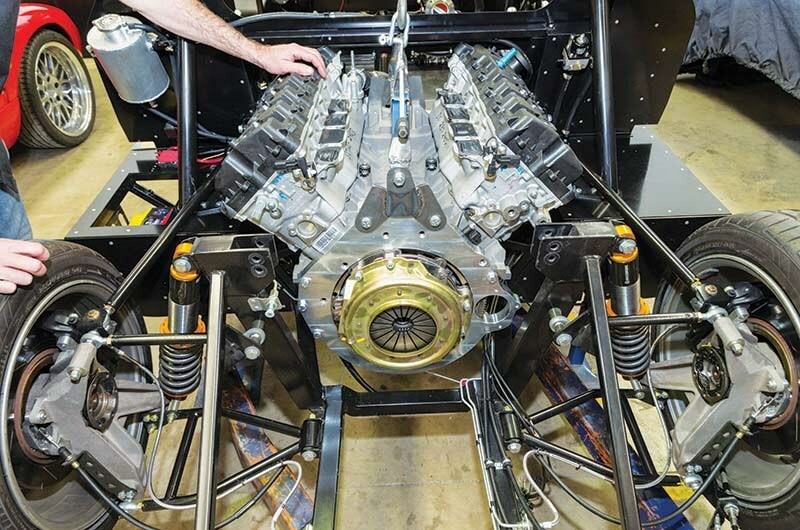 A high-comp (11:1) normally aspirated engine can hit 500 horses, while a supercharged version with 9.5:1 compression – also known as a Miami engine – can hit figures reaching the 700 mark! In somewhat less outrageous trim, you’ll find a Miami in the snout of FPV’s current hotrods. In any case, all three options are fuel-injected, which Sorensen sees as the only realistic way of getting through ADRs. He explains, "When a car is first registered, it needs to be compliant with ADRs of the time, so carbies are a thing of the past. It needs injection with the full emissions suite." 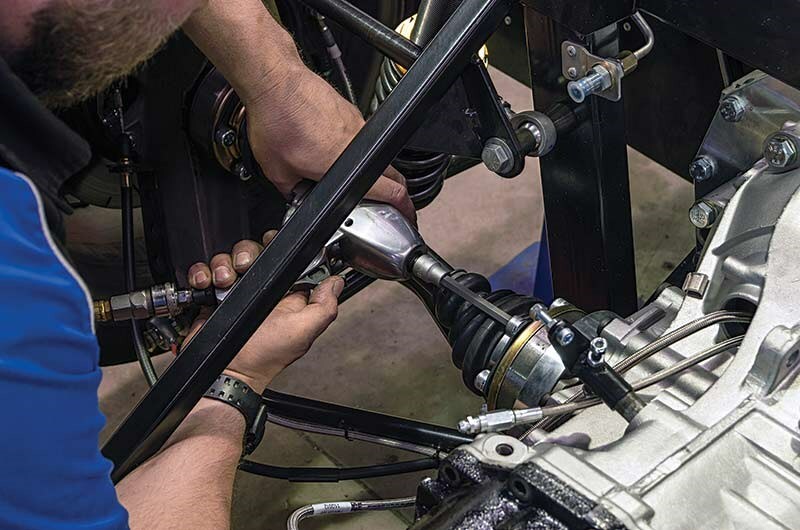 As for the loud end: "We make our exhaust systems in-house, they’re jig-made, and they’re ADR compliant. 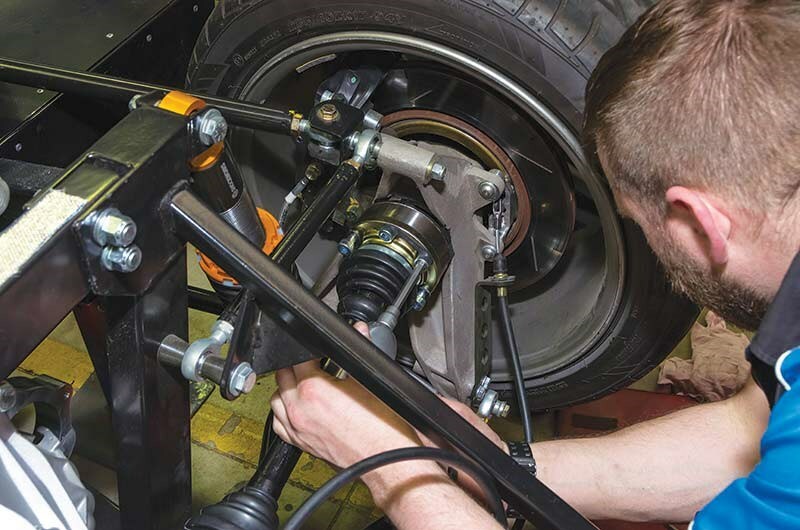 Because we’ve done the R&D and gone to the expense of getting the car tested, when a client uses our systems and tune, we’re happy to comply it. If they go with their own, they’ll need to go through their own testing." For Roaring Forties, the big theme is full integration and support, all the way to getting the car on the road. To that end, they’ve come up with turnkey solutions for all three powerplants, which means you can get a plate on it without having to do battle with your local rego people. The key is that chief engineer Paul Bottomley has ADR approval certification. In Victoria he’s known as a VASS engineer – the acronym stands for Vehicle Assessment Signatory Scheme. Part of Bottomley’s role is to keep in regular touch with interstate equivalents, so he can match up builders with their nearest engineer to ensure there are no nasty surprises at completion time. It seems to work, as the company lays claim to having road-registered GT40s in every state and territory. 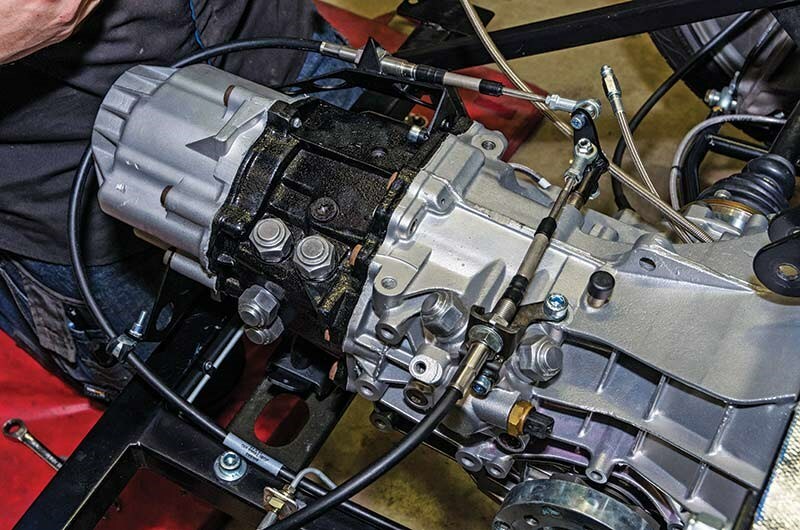 Getting the power to the ground is a remanufactured Getrag 01E six-speed transaxle. "Historically we’ve offered a number of options," says Sorensen, "After trialling and using a number of variants, we now offer one. It’s compatible with the cable-shift and reverse lock-out. 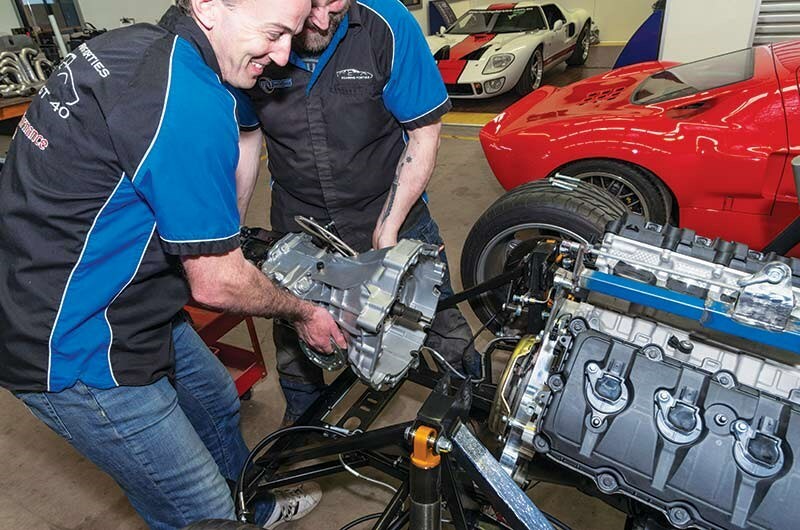 "Those transaxles, they’re bought second-hand, completely stripped and media blasted, then bearings, synchros and seals are replaced as a matter of course and anything else that needs it," he says. "They’re built with an LSD which is shimmed up and packed – they’re as good as new once it’s all done. It’s completed by a company in Queensland, part of our effort to keep as much local manufacturing as possible." In between, there is a conventional single-plate clutch for the Windsor, or two dual-plate options for the modular series engines. Your choices are organic or ceramic. The former is a more user-friendly set-up with a wide take-up point, while the latter is designed for ultra-high performance engines. Grunting and shoving aside, the engine and transaxle installation went incredibly smoothly and quickly. Okay, there’s a bit to do when it comes to getting it all hooked up and running, but at least now it’s starting to look like it might soon be out there gobbling up the highway.